Leopard print, pointed, and cap toe, oh my! 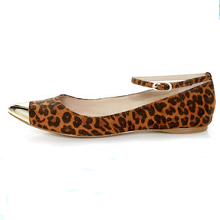 The Leopard Print Cap-Toe Pointed Flats don’t miss a beat! Leopard print suede upper is sleek and sophisticated, with a golden metal cap to top off the pointed toe, plus a thin, wraparound ankle strap that adjusts with a golden buckle. 1/4″ heel. Smooth leather outsole has non-skid markings. Available in whole and half sizes. Fit runs a little tight in the toe box; consider ordering a half size up if you’re between sizes. Measurements are for a size 6. Fabric upper. Leather balance. Imported.